This WolfPack™ 4K/60 Seamless HDMI Input Card is a 4K/60 4:4:4 compliant, 1-port input card designed to work with our WolfPack Matrix Switchers. The 4K/60 HDMI Input Card provides HDR resolutions including 4K/60, 4K/30 & up to 48-bit Deep Color at 1080p/60. The 4K/60 HDMI Input Card is used with the matrix for true plug-and-play cross-point switching from any HDMI input to any combination of outputs. The card has a 3.5mm connector for an embedded stereo audio input & when used with its companion 4K/60 Seamless HDMI Output Card with a similar 3.5mm output connector can de-embed the stereo audio from that card. This L/R audio embedder will allow the use of outboard audio amplifiers when used with the output card. This 4K/60 HDMI Input Card is used in the below HDTV Supply line of 9x9, 18x18 and 36x36 modular matrix switchers that feature one-slot card cages using 9, 18 or 36 of these one-port HDMI Input cards depending upon your system needs. It supports 18.2 Gbps of data throughput and a 600 MHz TMDS Clock frequency which is the highest specified under the HDMI 2.0 standard. SwiftSwitch™ SEAMLESS SWITCHING: This card used in our WolfPack™ Modular HDMI Matrix Switchers can be configured with instantaneous video switching which delivers full 4K/60 video powered by our WolfPack engine implemented at each output port. This high-performance engine processes HDMI signals by executing EDID hops and HDCP handshakes simultaneously at both the source input and the display outputs and scaling inputs for the best output resolution while setting the output clock timing and using a frame buffer to retain the input signal information for the fastest output. NOTE: Do not combine or use our 1080p based SDI, VGA or DVI cards with this 4K/60 HDMI card & our 4K/60 HDBaseT cards in the same matrix chassis. These 4K cards are designed to work only on 4K/60 based system delivering pure 4K/60 resolutions and cannot be combined with any analog, 4K/30 or 1080p card system. Why not buy this 4K/60 HDMI Input Card today? This card used in our modular HDMI matrix switchers can usually be integrated with many third party control systems using the RS232 port on the back of the matrix. 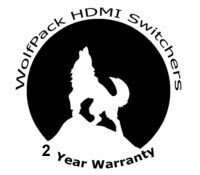 HDTV Supply includes a 2 Year WolfPackCare™ Advance Replace Limited Warranty on this card. The warranty states that the card will perform in accordance with the accompanying materials for a period of 2 years from the date of the receipt of the order & that the card will be free from defects in materials & workmanship under normal use. Slide-in Boards & HDBaseT Extenders: If a board or extender goes bad in the first 2-years & HDTV Supplys Tech Support team verifys the problem after a telephone call, HDTV Supply will send a new or like-new unit within the USA usually within 24-hours by USPS Air Priority at HDTV Supplys expense. We will ask for a credit card for payment in case the bad card is not sent back to us within 5-business days. You will need to provide us the tracking number as we will to you and you will need to pay for the cards return. In order to get a warranty replacement for a defective card HDTV Supplys Support Team will verify the product is eligible for a warranty. An RMA number will then be issued. Shipped replacements will be in like new conditions, tested and all components included. HDTV Supply also sells a 3 or 5 Year warranty for this card. Please call us for a quote.